Could Dark Horse rescue 1313 and First Assault? Wednesday, it was announced that Disney is closing down LucasArts, the video game division of Lucasfilm. This news did not come as a surprise to me, nor likely to many who follow the storied company closely. In the process, an estimated 150 employees have been laid off, including friends and former colleagues of mine. To they who worked very hard everyday to bring interactive Star Wars entertainment to the fans, we wish the best of luck. Like every aspect of Star Wars fandom, the pros and cons of this move will be hotly discussed and contested among fans, and perhaps I will join you when the wound has healed somewhat. 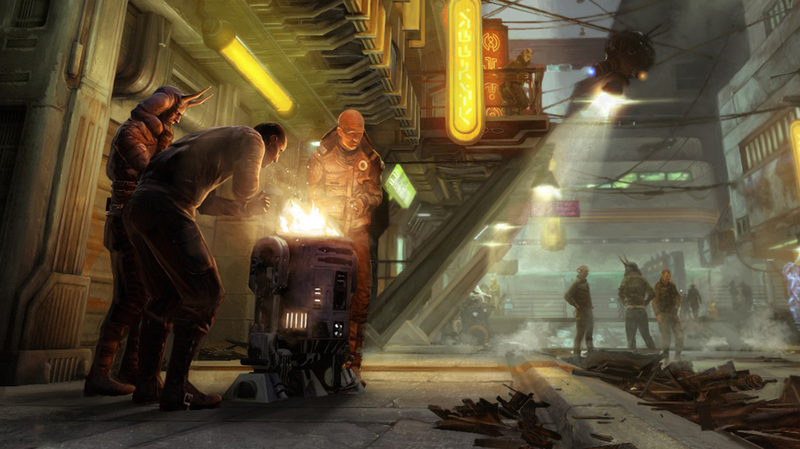 Meanwhile, for those who lament that they will never see cancelled LucasArts projects Star Wars: 1313 and Star Wars: First Assault, might I suggest that you may one day have a rescuer in Dark Horse Comics? Dark Horse has been fascinating to watch ever since Disney’s acquisition of Lucasfilm. When one company takes over another, it is common to eliminate redundancies and leverage synergies. As you know, Disney’s last major purchase was Marvel — the world’s largest comic book publisher. While it would be uncharacteristic to see the Star Wars license yanked from Dark Horse mid-contract, it is difficult to imagine that the House of Mouse will renew such a third-party deal rather than bring the creative in-house before the new movies. Whether or not Dark Horse is in their period of last-hurrah with Star Wars or not, the one thing the publisher and readers alike know is that Episode VII is coming. Any stories taking place after Return of the Jedi are now, almost certainly, doomed to be contradicted by the new movie. No matter how you feel about the expanded universe Skywalker/Solo clan, you know that any new adventures have the same built-in obsolescence as an iPhone in May. So not only is the post-ROTJ era somewhat poisoned for comics, but Disney CEO Bob Iger went on to tell shareholders that they may explore spin-off movies featuring established theatrical characters. With such ambiguity, anything during Anakin’s lifetime (give or take a master or student) is now in potential contradiction zone. In the midst of this creative hand-cuffing (something that Dark Horse Vice-President, Randy Stradley, cannot stand at a subatomic level), Dark Horse pulled perhaps its smartest move since Dark Empire. The Disney announcement has brought new interest and hope to Star Wars that hasn’t been seen since the world heard little Anakin shout his first “Yipee!”. These fold-returners love Han and Chewie and have never heard of Cad Bane, let alone Mara Jade. So Dark Horse hired top-tier talent, plunked them down a few weeks after Luke blew up the first Death Star, and launched a series beholden to nothing but A New Hope and The Empire Strikes Back. And it sold. And sold. And sold. What else could Dark Horse do to appeal to classic Star Wars fans while staying out of the Episode VII continuity mire? Last week they announced a comic set in the ultimate alternate Star Wars universe — the one older than the name Luke Skywalker. They are adapting George Lucas’ original “The Star Wars” screenplay that was later broken up and paired down to what eventually became Episode IV. The nostalgia and mystique around this one will no doubt appeal to a much broader audience than another chapter of Legacy. Brilliant. The creation of a modern-era console video game is a many-million-dollar proposition: More than the cost of filming A New Hope. When LucasArts was still owned by George Lucas, each of those dollars was one of Mr. Lucas’ dollars. And Mr. Lucas did not like to waste dollars. As such — unlike the comics, novels and games — video games were subject to much more rigorous and involved story pitches and approvals from the creator himself. So the now-cancelled 1313 and First Assault are among the last remaining unreleased pieces of Star Wars with direct creative involvement from Mr. Lucas. The mystique appeal surrounding two anticipated-but-cancelled Star Wars worlds with George Lucas’ fingerprints all over them sounds exactly what this invigorated outside-the-box Dark Horse crew would be looking for. There are man-years worth of designs, storylines, characters and settings to mine — particularly with 1313. With no games actually coming out, there should be few pesky continuity entanglements that potential writers will need to be constrained by — something Dark Horse would relish. Chances are there were already plans in the works for tie-in comics to these games, but it should surprise no one if Randy Stradley visits the soon-empty LucasArts offices to explore the abandoned worlds of 1313 and First Assault. If those stories cannot be told on a console, the pages of a graphic novel may be the next-best alternative for Star Wars fans. While we’re at it… I’m calling a Clone Wars: Season Six comic series. After all, Dark Horse invented the continue-the-cancelled-TV-show comic genre that’s all the rage. Great idea, especially continuing TCW! Here’s hoping DH somehow keeps its license. Since we probably never get 1313 as a game I would love to have it as a comic, there is nothing worse then a wasted idea, and talent. Though when reading I will always remember the interaction I lost :( I would love to play that game but reading it is the next best thing! I really hope we get a comic series or novel out of it. I suspect not. Dark Horse only confirmed its license until 2014 on a recent Jedi Journals interview. Randy Stradley said no new series were in production. I suspect now is not the time for Dark Horse to launch a new series – and either 1313 or TCW would need to be a major new series. I hope I’m wrong, but I came away from that interview somewhat less optimistic about the Dark Horse license. The problem with touching 1313 at all is that it connects to “Star Wars: Underworld.” If Disney ever has plans to cultivate that into a television series or a new film saga outside “The Skywalker Saga,” it might be best to just leave that alone until that time comes and keep it as something we haven’t ever seen before. If “The Clone Wars” sees closure in anyway other than the screen, I will be extremely disappointed. I hope the fans can keep it alive enough that they either give us another film down the road or the new series’ production can be used to crank out a tale here and there over the next few years which brings those final stories to us. It was a good article, Paul. Interesting read. They probably won’t considering TCWs trampled all over their prior work, and canon. Funny, Dark Horse hasn’t had a problem doing The Clone Wars based-comics thus far. Let’s not forget, fans are the ones who get up in arms over ‘canon’ in regards to TCW: The professionals know the deal. Not to mention Randy Stradley himself actually co-wrote a Season 1 episode, Innocents of Ryloth. That’s interesting. I actually speculated that DH would continue TCW shortly after they announced TCW was cancelled. 1313 and First Assault would be cool too. It would be wonderful news if this came to pass. I was so looking forward to 1313. Lucasarts made some of my favorite games: The Monkey Island and Dark Forces franchises, Battlefront, Star Wars Racer. They’ll be greatly missed.